One thing I’ve observed when I was on holiday in the Philippines is that it’s quite hard to find a vegetable dish in restaurants and food courts. I’m pretty sure this isn’t always the case when one goes to upmarket Makati or other places in Manila and QC. But I am just saying… an ordinary person like me walks into a mall (o sya sige na SM Mall) and I couldn’t find one single establishment with a ‘proper vegetable dish’ on their menu. Read: meatless vegetable dish. Hindi yung vegetable dish na may tipak-tipak na baboy. Sinigang, pancit and kare-kare are NOT vegetable dishes. Some offers kangkong with alamang, thanks for that, and I found a beautiful tofu dish once, love it. Those are exceptions. Can’t help it, I like having veggies with my main. 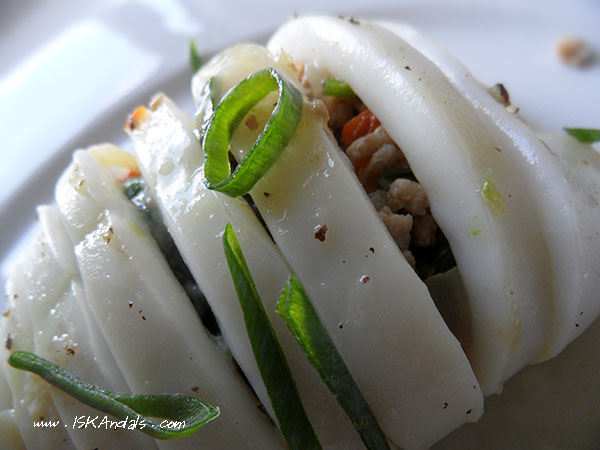 Anyway, I once ordered grilled squid and was pleasantly surprised to discover they were stuffed with Chinese cabbage instead of the usual meat mixture. 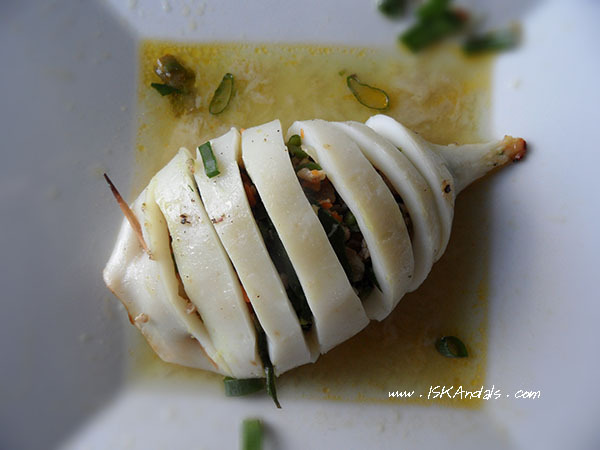 That is my inspiration when I cooked this set of succulent stuffed calamari – my 1st entry to Our Growing Edge monthly event. Isn’t it a clever way to get the boys to eat vegetables? Sneaky me hiding them eh but I added a wee bit of minced pork. Wash squid tubes and dry on paper towels. Rub with a mixture of olive oil (2 tbsp), salt and freshly ground pepper. Set aside while you prepare the other ingredients. Heat 1-2 tbsp of oil in a pan. Sauté onion until transparent. 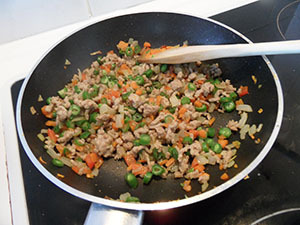 Add minced pork and cook for about 2 minutes. Season with salt and freshly ground pepper. Add bell pepper and carrot, and continue to cook for another couple of minutes. Add the green beans and cook until al dente. Drain pork mixture on a colander to remove oil or any liquid. Mix 2 tbsp of lemon juice with 2 tbsp of olive oil in a bowl. Season with small amount of salt and freshly ground pepper. 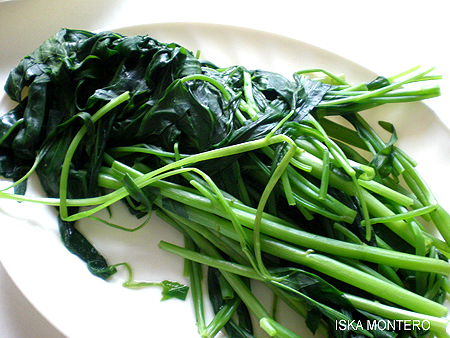 Combine with baby spinach leaves and spring onion ringlets. Divide into 4 parts. Divide pork mixture into 4 parts. Chuck in half part of spinach leaves mixture into a squid tube followed by one part of pork mixture. 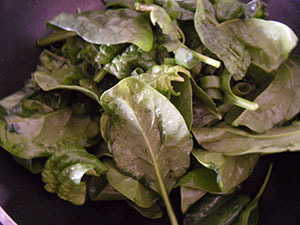 Then chuck in the remaining half part of spinach leaves mixture. Secure end with a toothpick. Repeat procedure with the rest of the squid tubes. 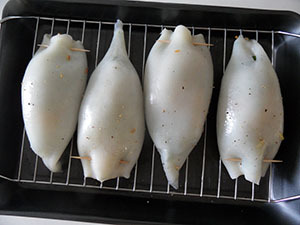 Arrange squid tubes on a grill over a baking tray. Fangrill on 200 deg C for 10 minutes. You may turn over halfway or leave as it is. Serve right away. Remember not to overcook. Mix soy sauce with lemon juice (or kalamnsi juice) and serve as condiment. Lovely eaten with steamed rice. This looks really good, I’ve seen a lot of squid at the supermarket lately and was wondering how I cold use it. Pork works great with seafood I’m sure this is delicious.